Men's supported FKT: Gary Robbins, 18h52m, July 1-2, 2015. Previous men's supported FKT: Kyle Skaggs, 20h53m, Sept. 23-24, 2006. Women's supported FKT: Jenn Shelton, 22h04m47s, Aug. 30-31, 2015. Previous Women's supported FKT: Darcy Africa & Krissy Moehl, 22h22m45s, Aug. 22-23, 2013. Men's unsupported FKT: Brian Donnelly and Yassine Diboun, 25h48m, Sept. 16-17, 2014. Women's unsupported (team) FKT: Mallory Brooks & Allison Macsas, 29h12m25s, Aug. 14-15, 2017. Women's unsupported (solo) FKT: Candice Burt, 31h11m57s, Sept. 19-20, 2012. Jason Vaughan has done a double Wonderland in 89h35m, Sept. 6-10, 2012. 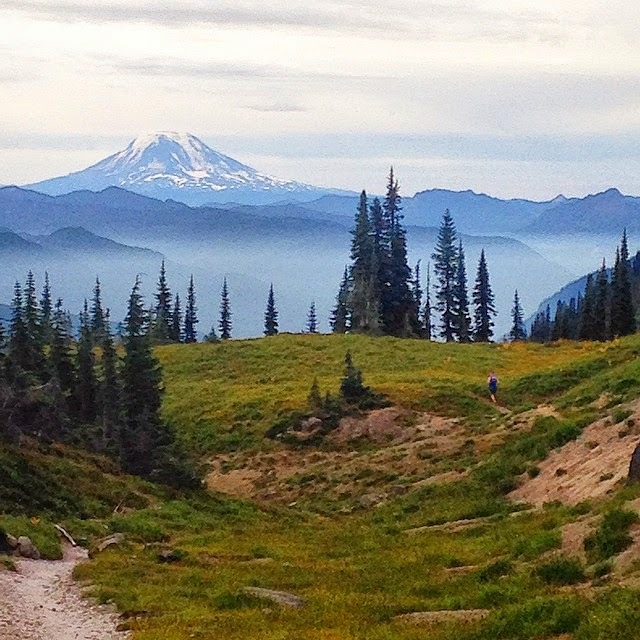 The Wonderland Trail is an amazing, rugged 95-mile loop around Mt. Rainier, the highest peak in Washington State. 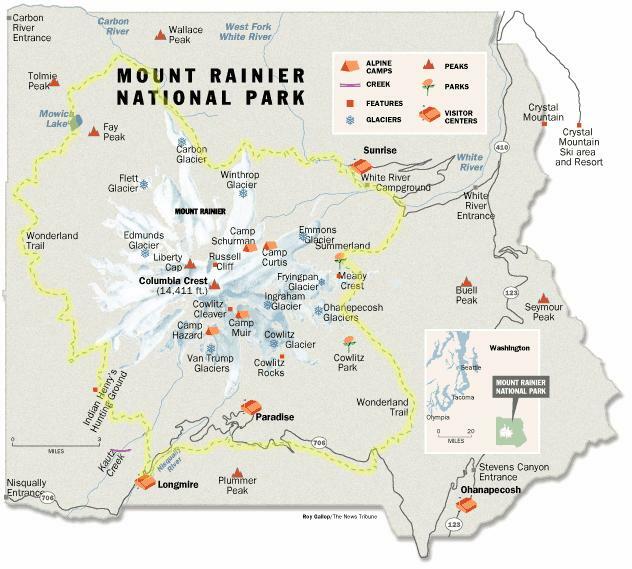 I have copied the NPS map here in pdf format. In 2003 mountain biking legend John Stamstad ran the trail self-supported in 24h01m. His trip was reported in the May 2004 issue of UltraRunning Magazine. Kyle Skaggs beat that time on Sept. 23-24, 2006, 20:53 (fully supported). Skaggs' fast time may have discouraged others from attempting all-out, suppported trips, as most subsequent efforts have been unsupported. 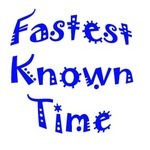 However, Skaggs' time was finally bested by 2 full hours by Gary Robbins on July 1-2, 2015. Robbins clocked 18h52m for the loop. A detailed video from Robbins' run is here. Champion ultrarunners Darcy Africa and Krissy Moehl set the women's supported FKT on the Wonderland of 22h22m45s, August 22-23, 2013. An excellent trip report (titled "Better Than Expected"!) is on Moehl's blog. Two years later, Jenn Shelton announced on instagram that she had bested this record by 18 minutes, with a time of 22h04m47s on August 30-31, 2015. This is the third fastest time by anyone, behind only Robbins' outstanding 2015 FKT and Skaggs' 2006 run. Shelton's complete report is as follows: "Here's (a photo) from Sunday, starting a 93 mile loop on the Wonderland Trail around Rainier. 22hr04min47seconds later I finished. Thanks to Krissy + Darcy for setting a fun goal, and of course thanks to my silly crew @haydenteachout (photog) and some opinionated little fucker named Colin." Trail Runner Magazine has a nice article on Robbins' and Shelton's runs. Jeff List ran the Wonderland unsupported in the clockwise direction starting from Mowich Lake at 3:00AM on Sept. 5, 2009, in 33h45m. "Conditions were brutal, with heavy rain, wind, and temps in the 30's," List reported. His trip report, with splits and a Google Earth route, is here. Isaiah Janzen bettered List's unsupported time by over 2 hours on Sept. 14-15, 2010. Janzen's light failed during the run, but he continued by the light of his iPhone until finding a tarp by a patrol cabin, which allowed him enough warmth to sleep for a few hours. Some might view use of the tarp as a violation of the "rules" for a purely unsupported trip, but one does what one needs to do to survive. Janzen's full TR is here. As reported below, Sean Meissner (33h26m) and Sam Thompson (32h33m) both did unsupported trips on the Wonderland during Sept. 2011. Both failed to beat the FKT, but nevertheless ran impressive times. John Reese lowered the unsupported FKT on the Wonderland to 28h50m on Sept. 14-15, 2012. As reported below, Reese started out with his brother Dan, but Dan had to bail due to injury. The pair confirm that John Reese completed the route in true unsupported style (see discussion below). A report is on the Reese's blog. Exactly a year after Reese's FKT, on Sept. 14-15, 2013, Richard Kresser of Tacoma, WA, put the unsupported Wonderland FKT down to 27h16m, as reported below. Finally, another year later, Sept. 16-17, 2014, Brian Donnelly and Yassine Diboun did the Wonderland unsupported (clockwise) in 25h48, as reported below. Honorable mention goes to Luke Distelhorst who completed the Wonderland unsupported in 26h36m on September 26-27, 2015, as reported below. One other trip of note was Joe Grant's September 2011 unsupported run. After about 20 hours, and With just 10 miles to go, Grant was on pace to finish comfortably under 24 hours. But, a close encounter with a mountain lion scared him off the trail. "In one day, I found myself touching extremes in both strength and vulnerability," he said. Also on Sept. 14-15, 2012, Darla Askew & her husband did the Wonderland unsupported in 31h36m, starting & finishing at Longmire and going clockwise. This is the first FKT reported for a woman on the Wonderland. But, just 5 days later Candice Burt did the Wonderland, clockwise from Longmire, finishing in 31h11m57s, for a new women's FKT. Burt travelled solo. Links to her trip report and gps data are below. Most recently, Mallory Brooks & Allison Macsas set a new women's unsupported (team) time of 29h12m25s (CCW) on Aug. 14-15, 2017, verified by real-time satellite tracking using a Delorme InReach tracker. Their trip report is here: wonderlandtrailfkt.com/the-run-report/ ; and their GPS track is here: www.strava.com/activities/1145246283 . As reported below, Jason Vaughan did a double Wonderland, Sept. 6-10, 2012. He started at White River Campground at 7:45AM on Sept. 6, and travelled clockwise (unsupported), finishing the loop in 33h35m. He then resupplied, and hiked the loop counter-clockwise, finishing the double Wonderland in 89h35m, at 1:20AM on Sept. 10. The weather is good and I am aiming for an unsupported clockwise running of the wonderland trail, starting this morning. I will be starting from Longmire and going for it. I didn't think I was in great shape but I ran The Enchantments a few days ago in 5:11 and I feel great. I also ran Halfdome in Yosemite two weeks ago and that was rather easy as well. So, with the encouragement of many friends in Seattle, I'm going for the longest unsupported run I have ever tried. There is no thread for that run... I hear the record is by a Leavenworth citizen at around four hours. I've been dreaming of running the Wonderland solo for many years, and this year, instead of dreaming, I decided I'm going to do it. I was planning on an unsupported fkt attempt in late-July or early-August. However, there's still way too much snow for that. So I've postponed my attempt until early-September. I got some great feedback from Isaiah regarding his trip, and I also emailed Jeff, hoping to hear back from him. Anyway, I just wanted to put it out there for all to see. I'm going for the Wonderland unsupported fkt tomorrow, Sept. 13, 2011, planning to start at 0500 from Mowich Lake, going clockwise. I'll report back when I'm finished! 33:26. That's how long it took me to run/hike/walk/sleep the Wonderland Trail around Mt. Rainier on Sept. 13-14, 2011. I started at Mowich at 4:50 a.m. and went cw. By far, the longest solo, unsupported adventure run I've ever done. I'm working on a trip report now, but will say this: Isaiah has it right in starting at Longmire going cw, as getting the difficult Longmire-Mowich section done first is very wise. One heck of an adventure!!! Nice job Sean! Glad to hear you are safe and hope you had fun! I'm planning to attempt the unsupported record too, and am leaving tomorrow Sept. 16 from Mowich in the evening... 6 or 7pm and will be going clockwise. My compadre Brock Gavery is also joining me for this adventure, and our main goal is to have fun and enjoy the loop- speed record secondary. Should be interesting tackling the night section right off the bat. I'll post when we're back and report how it went down. 32:33 - that was our official time on the Wonderland Trail, so fkt definitely still stands. We flirted with it for a while, but bad weather and a likely poor choice in start time (leading to extreme sleep deprivation) ultimately dropped us off pace by the time we finished. Started at 8pm Friday Sept 16 at Mowich, and finished Sunday early on the 18th. Starting at night was interesting, but having zero sleep since Thursday made for a rough go of it. Ah well- this loop is such a gem, it is always an incredible adventure and the scenery is breathtaking! I ran the trail unsupported in 30hr 30min from August 21st-22nd 2011. Here is the link to the write up. Outstanding! Congrats. I'll update the info above shortly. Thanks for posting. After reading about the snow I'm glad we didn't backpack the trail in July as planned! Starting 6 AM Thursday, September 6th I will be attempting to be the first person to ever run the Wonderland Trail unsupported TWICE in one go, reversing direction for the second loop. That's a total of 186 miles, and 44,000 feet of elevation gain. I will be starting at White River Campground heading clockwise and carrying all of my calories for the first loop. When I return to White River at the completion of the first loop, I will access my car for my calorie cache for the second loop. I hope to finish under 80 hours. My main goal is simply to be the first to do it and establish the route and the initial FKT, then enjoy watching some really talented runners come through next year and peel it off in 50 or 60 hours. I think the reversing double is a legitimate route, being the most complete experience of this unique trail. The character of the Wonderland Trail varies considerably with the direction of travel, as does the difficulty and runability of the route. I have through-hiked the Wonderland 5 times, and run it three times (in 3 days, two days, and four days, respectively). In May of this year I was the eighth of nine finishers of the inaugural Pigtails Challenge 200 mile endurance run, finishing in 69 hours 24 minutes. I had decided that if I could finish the PTC200, I would attempt a double Wonderland, so here goes. I will post a trip report about my attempt on my blog at ultrapedestrian.blogspot.com after I return. I'm taking a stab at the unsupported Wonderland Trail FKT this weekend, beginning 6AM on Saturday 8 September and running clockwise (likely from Longmire). At 7:45AM on Thursday, September 6th I left White River Campground heading clockwise around the Mountain. I returned to White River Campground 33 hours and 35 minutes later. I ate, resupplied, took a 40 minute nap, then headed out counterclockwise on my second loop. At 1:20AM on Monday, September 10 I returned to White River Campground for the second time, to complete the first ever Double Wonderland, Reversing after a total of 89 hours and 35 minutes on the trail. I will update this with a link to my blog in a day or two. What a blessing to get to spend all that time doing my favorite thing in my favorite place.